Topshop is launching a collection made entirely from discarded textiles, including surplus stock and production offcuts. A collaboration with Reclaim to Wear, an initiative from pioneering eco-fashion label From Somewhere, the line includes color-block jersey maxi-dresses, gray marled-cotton baseball pullovers, ombre-bleached boy-shorts, and slouchy denim rucksacks to satisfy your your every festival-dressing need this summer. “This is the first step towards the creation of zero-waste design collections,” says Orsola de Castro. This isn’t Topshop’s first foray into sustainable fashion. The British retailer partnered with hip-hop star Pharrell Williams in 2010 on a line of denim made with recycled plastic bottles. The following year, Topshop tapped local designer Izzy Lane to create a series of ethically produced coats using wool from Lane’s own flock of rescued Wensleydale and Shetland sheep. 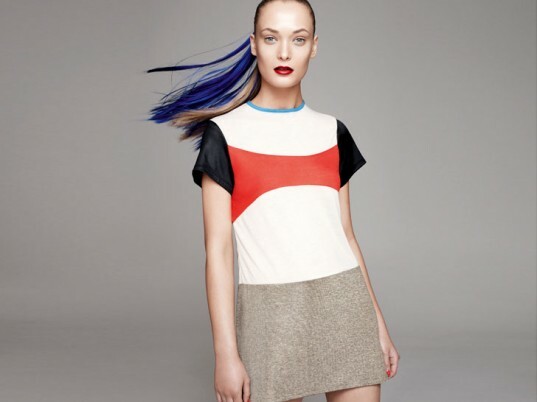 The Topshop Reclaim to Wear collection is slated to hit stores, as well as on www.topshop.com, on June 15. Denim jeans (price to be determined). Denim rucksack (price to be determined). Denim short (price to be determined).